What a great night at Westminster Skeptics. The keynote speech was made by medical doctor, philosopher, humanist and polymath Dr Raymond Tallis. David Allen Green contributed a legal overview. We were addressed by the 'Libel Survivors': Simon Singh, Ben Goldacre and Dave Osler. And Dr Peter Wilmshurst was also there. It's a name so many of us know. Great to put a face to it and to hear about his ongoing case. Sile Lane from Sense About Science told us about the campaign to change the Libel Laws and the way forward. The scrum for the bar at half time was followed by Dr Evan Harris MP and a panel which was joined by Professor David Colquhoun. I was chairing and couldn't take many piccies or notes for a full write up like I normally would. So here are some 'quotes of the evening'. There were many more, including a few from Evan Harris (who may have a future in stand-up if the politics thing doesn't work out). 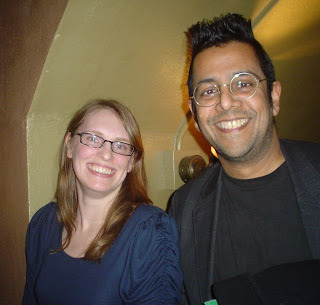 Best of luck to Simon Singh at the Royal Courts of Justice today. "It would be no great advance if scientific truth were to be decided by the litgant with the deepest pockets than if it were determined, as in the past, by the priest, the shaman, or by the alpha male with the most powerful fists"
"Evidence-based scientific medicine represents not only triumph over nature, but a triumph over human nature in the very place where the temptation to deceive others and one's self is overwhelming"
"It's a sort of perverse form of S and M because, like the Catholics, we know it's good for us"
"Censorship doesn’t begin in the courtroom, or with the angry letter you get from the lawyer, or even from your home computer. Censorship begins inside your head, it’s the voice that tells you not to write an article in the first place"
"The law is now more patches than trousers"
I was at court briefly this morning - Simon had so many supporters they couldn't all fit in the court room. All sorts of people turned out to support him, not just the SitP crowd. I was sitting between his agent and publisher. Hopefully someone who had the whole day to spend there will report back to us.